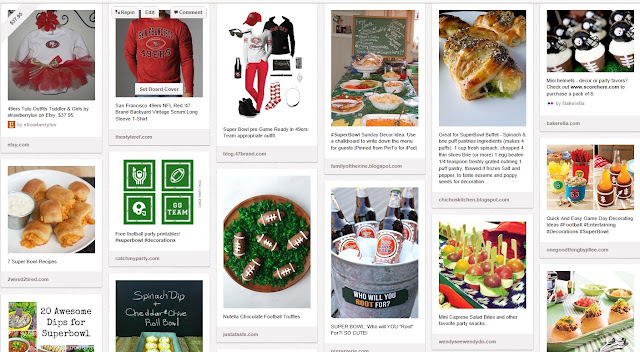 Beauty Around It: Super Bowl + Food + Beverages = Party! Super Bowl + Food + Beverages = Party! We're all getting excited for the big game, right? When I think of a good Super Bowl party I think of yummy food and beverages. Beverages are a no brainer, beer and more beer. But, food can be more exciting! Super Bowl food has really turned "mini!” Mini chili bowls, mini nachos, mini pizza, mini EVERYTHING. When it's mini you can eat lots, well at least that’s what we think, right? Now, it's time to get snacky! I've spent the last few days online, pinning on Pinterest, and thinking about what I'm going to have time to cook. On the big day we all want to be enjoying time with friends and not slaving away in the kitchen, so finding something quick and easy will keep everyone’s taste buds happy, and give you time to spend with friends and in front of the big game! I'm leaning towards mini chili bowls, and mini dip rolls. I love the idea of having my dip already inside my bread bowl - creative, right? I've made mini chili bowls before and they are so easy and definitely a Super Bowl hit. Here's a quick recipe – honestly you could probably make these in 15 minutes if you have the chili pre made or you use a can. Buy croissant dough in a roll and mold into muffin tins so that you have little cups. Cook for about 12-15 minutes until the edges are a little brown. Poor the chili into the bowls and place a little sour cream, green onion, and cheese on top. Put back into the oven to melt the cheese. Remove from the muffin tin and place on a serving tray. Check out my Super Bowl Pinterest board here and below. What are you making this Sunday? If you aren’t really that interested in football you can still have fun at a Super Bowl party. Here are a few games/topics that you can engage with if you are not interested with what’s on TV. Who will win the coin toss? How long will it take to sing the Star Spangled Banner at the beginning? What color will Beyonce’s outfit be during half time? What is going to be the best commercial? What celebrities are going to be in the commercials?